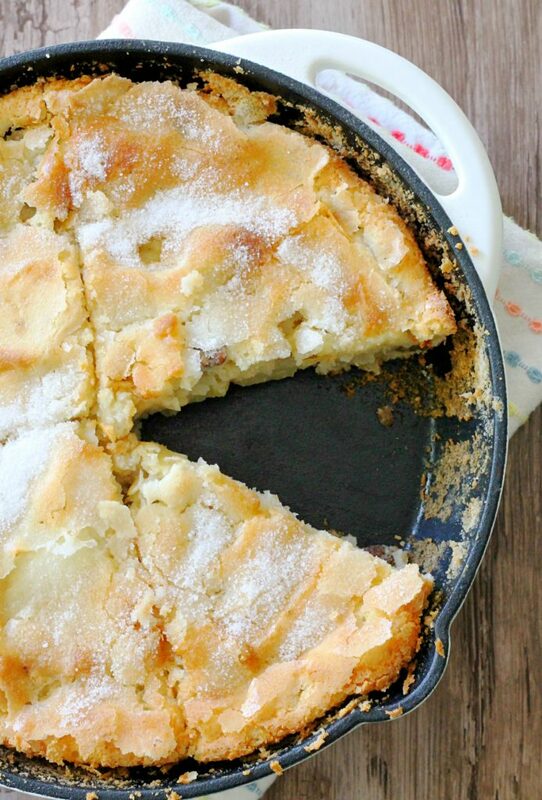 French Apple Cake meets Kentucky Bourbon Country with this simple yet stunning skillet cake. I love a good cake. 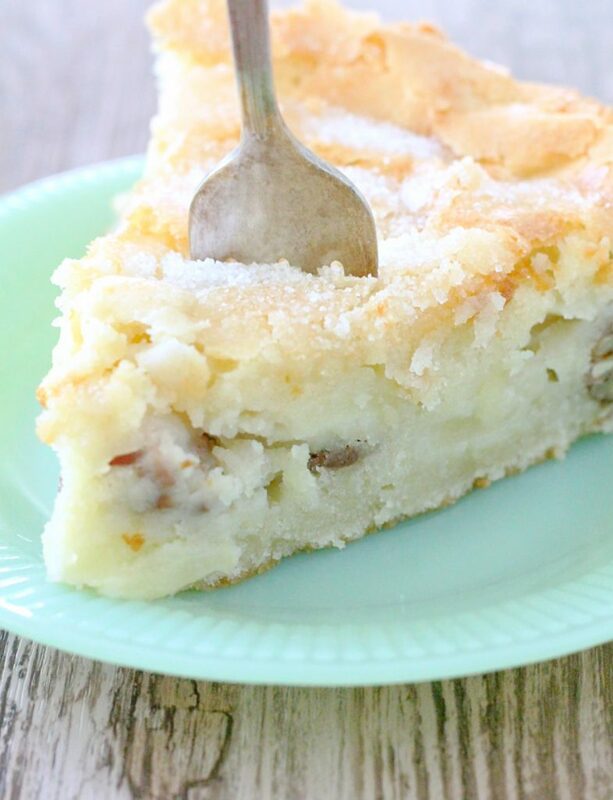 And this Kentucky Apple Skillet Cake is so good. Remember that French Strawberry Cake I made a while back? It’s the most viewed and made recipe on my blog now! I love a simple cake that has that ‘wow’ factor and apparently lots of other people do too. I wanted that cake (with its crackly top and custardy center) but for fall. Something that goes with football, falling leaves and crisp air. 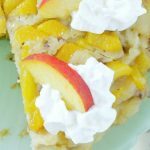 A classic French apple cake is lovely, but I wanted it to be more homey. I live close enough to the river that I like to consider myself a Kentuckian sometimes. Especially when it comes to bourbon. So I decided to add bourbon soaked pecans and apples to my cake batter. And top it with butter pecan ice cream. Oh yes I did! So here we have a cake you’ll want to make all season long. It is apple picking season you know. And there’s really not that much bourbon in it. But if you’d like to abstain the cake is still just as delicious without the addition of bourbon. And let’s talk about texture. I’m not sure how a cake with so few ingredients can come out with such a moist and custard-like middle plus a crackly, pretty top. It’s like magic. Your people you make this cake for will think you are practicing sorcery in your kitchen. Or that you are just a really good baker. Make this your “secret” recipe. Your secret is safe with me! 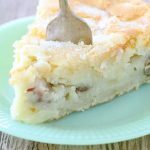 A southern version of a French Apple Cake - this apple cake is custardy in the middle and has pecans and bourbon in the batter. Preheat oven to 350 degrees. Spray a 9-inch cast iron skillet with cooking spray and set aside. Toss the apples and pecans with the bourbon and set aside. In the bowl of a stand mixer, whip together the butter and 1 cup of the sugar until pale and fluffy, 3 - 4 minutes. Add the eggs and vanilla and beat until smooth. In a medium bowl, whisk together the flour, baking powder and salt. Add the flour mixture and sour cream to the batter and beat on low until a smooth batter forms. Fold in bourbon soaked apples and pecans. Spread the batter in the prepared skillet. 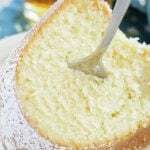 Sprinkle the remaining 1/4 cup of sugar evenly over the top of the cake batter. Bake until a wooden pick inserted in the center comes out clean, 35-40 minutes. Let the cake cool in the skillet. 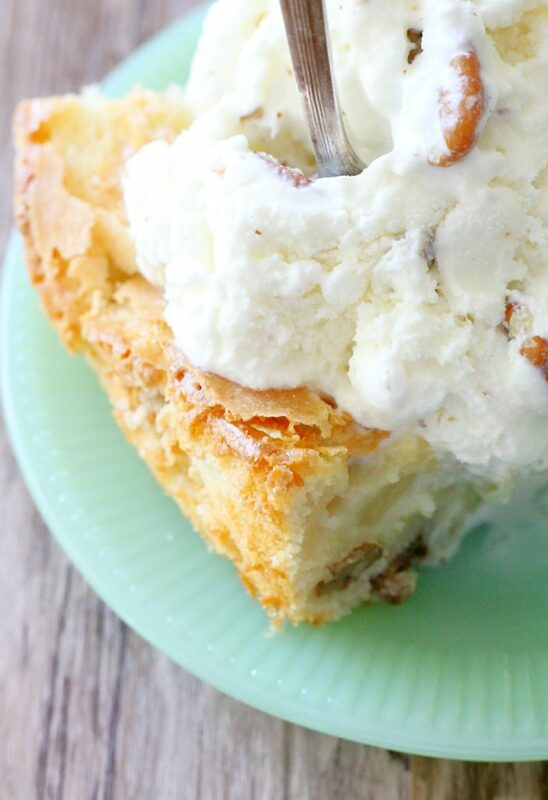 Serve cake slices topped with scoops of butter pecan ice cream. Love this cake? Don’t miss out on my STRAWBERRY version. Click the picture for the recipe! Can I make this if I don’t have a cast iron skillet? Substitute? 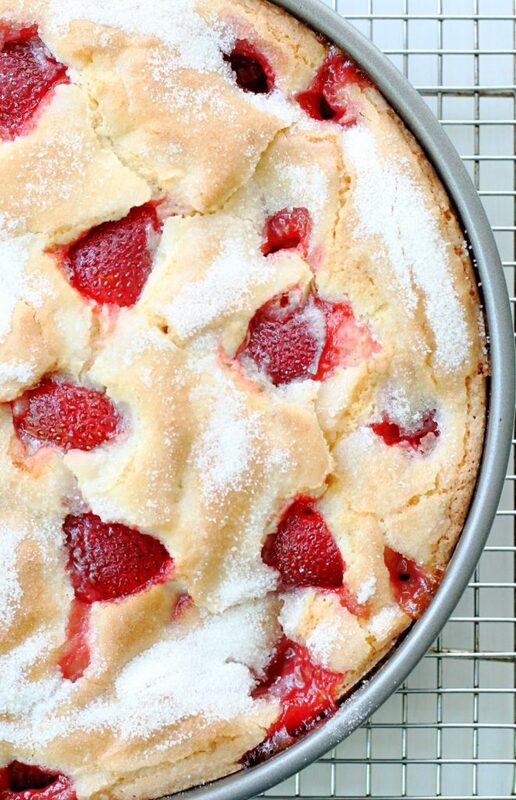 You can make it in a standard 9-inch round cake pan. I hope you like it! Do I have to use bourbon? No. Omit completely or use a little extra vanilla extract. Looks gooey incthe middle, is it? The top looks flaky and delish. I don’t have bourbon. Can this be left out? Yes it can be left out. You can add a bit extra vanilla extract if you want. Made this cake today, and we loved it. Made substitutions of green apples and used a cake pan. The bourbon adds a nice bit of flavor as well. Plan to make this again! It’s really just a splash of bourbon. You can omit or add a little extra vanilla extract. Is it possible to omit the pecans? Would this recipe work with a springform pan? Yes I think it would. I know other readers have used a springform pan with my French Strawberry Cake (which is the same base recipe) and it has turned out fine. It’s called a cake but is it at all like a pie? I was thinking of making it for thanksgiving. No it really is like a cake. Let me know if you try it! The strawberry version has been making me look good for almost 2 years now! I just baked the apple version in the skillet. It smells and looks amazing. I’m so excited! Thank you for the great recipes. Love hearing this. You are welcome! Thank you for the vote of confidence 🙂 I hope you enjoy the cake!